Memories from last year's Árok: awesome SIDRIP gig. Be prepared 'coz we're going to open up (and drink) the world's biggest bottle of champagne on stage to celebrate the 20th Árok Party, the home of SIDRIP. You can expect the usual great retro feeling and a few new remixes from us too. Don't forget the date: 18th August 2018, Ajka, Árok 20th Edition demoparty. SIDRIP gig season starts soon. Still (a)Live. Ajka, White Dog Pub, 28th of April. Tho life doesn't stop changin' one thing is rock solid: SIDRIP concert at Árok Party. Be there at the housewarming party of the new Árok place on the 12th August in Ajka, where we introduce our new guitarist and some new tracks as well. After 20 long years Demobit is back. Good news to those who were patient, Bratislava, Slovakia has demoparty again. SIDRIP will transfer its musical energy to the reborn Phoenix on the 28th January, come and have a great one with us. This year keeps marching forward. We're preparing for the biggest step for us this year, so far: on 5th of November (19:00) we will open for our biggest influence, Machinae Supremacy during Pixelcon 4. It will be the biggest SID rock event of this country so far. Come and let's party! This year's Fuction demoparty is a must have event for all the sid-rock fans out there: SIDNIFY and Double Score Dungeon will warm up the stage on 9th Friday, then SIDRIP is going to blast on 10th Saturday at 6PM. The SID jukebox contains every SID that we've ever remixed and SID version of our ReLive CD's content also available on the site. Our next gig is the usual (and band's favorite) Árok Party saturday night at Ajkarendek, 30th July 2016. After 6 years we will play again in the original formation: Gery has joined to the band to make our songs more solid with his rhythm guitar. Official concert info: SIDRIP Alliance @ QB Party, Sülysáp, 20:30 CET, 14th May 2016. Be there. Less official concert info: Come and kick off the summer season with us! We promise a great tracklist, friends, palinka, goulash and sleeping in a car's trunk for the whole weekend. Concert section has been updated with the latest photos, videos and info of our past (PixelCon, QB Party, Árok Party 2015) and upcoming gigs (Function 2015). If you downloaded FLAC/OGG/WMA packages from our site please redownload them as the last song (Commando High Score) had wrong metatag (same as Swing). Kudo to Anssi Saari for the warning! For its fifth birthday the band will give not one but two live gigs (MegaLIVE) on Árok Party 2015 at Ajkarendek. The first one will start at 20h, 14th August, while the second at 19:45h, 15th August after the debut concert of a new band called Double Score Dungeon. We have prepared some surprises (not only for your ears), so come and celebrate with us! It seems we will have busy year: two gigs within a month! The first one will be at 9th May on PixelCon party (1 Blaha Lujza square, Budapest), the second at 16th May on QB Party (6 Szent Istvan square, Sülysáp) which is a new demoscene party in Hungary. So you have no reason (like have another program) to stay away, so see You there! To cut it short: party with long history, old band, new place and songs. At 4th of October 8pm SIDRIP Alliance strikes down again to your ear. For pictures (thx to Jootka) click HERE. As it seems we're following a tradition of last-minute decisions when it comes to live gigs every year. This time our brill bassist Hermit had an important show to play elsewhere during the date of the next AROK gig - and without a good bassist, playing a SIDRIP Alliance show is impossible. Fortunately for us it turned out that Gery (Vincenzo's brother who kept helping the band since the start) is a pro-grade bassist who can be a great substitute of Hermit. So we will meet onstage again at AROK Party, 19th of July to make you all sweat there! Click here to get a taste of our earlier gig at Árok Party in 2012. It's time to write down (fortunately) the usually: how fenomenal was this gig, the mood, the audience and how we enjoyed playing to our friends but it would be pointless. Who was there and listened Rage of Emperor (our first own song written by Vincenzo) and Diablo - understand us. Thanks boys and girls, organizers, friends and fans! We had an amazing gig again! First we worried because we had to play inside a gym (because the rain) but Vincenzo made miracle with the sound system. Viki was dancing with the band and with the audience too given some visual amusement too :) After the shorter (but harder) concert everybody was satisfied and tired: this is how revel the hungarian scener! Thank you for the organizers to make this great party year over year! For pictures click HERE (made by Jutka again). That was close: we barely could find free time to schedule our practice day. But in the end we solved the riddle so be prepaired for our gig at Arok Party at 6. July, 7pm! If you like electric music more you will be glad because ErrorPort/SoulVoid will play before us! Click here to get a taste of our previous gig at Árok Party in 2012.
download DVD (3.6gb, zip), cover and disc art. A short time ago we stood on the stage with two nice girls (Ziona and Viki) and now it is history. We've got everything what we could ask for: enjoy to playing great tracks, friends, girls, singing audience and rock. For the first time you could hear Myth and Electric Jesus remixes from the band. For pictures click HERE, to listen the concert click HERE (thx to Ziphoid, Topy and the SceneSat radio). Function party - which is the most popular demoscene party of Hungary - will be held between 28 and 30 September, 2012 in Budapest. As in the past few years SIDRIP Alliance will play live again at saturday night. We release a new studio remix into the wild: please welcome Ben Daglish's crazy music: Krakout [mp3] [flac]! 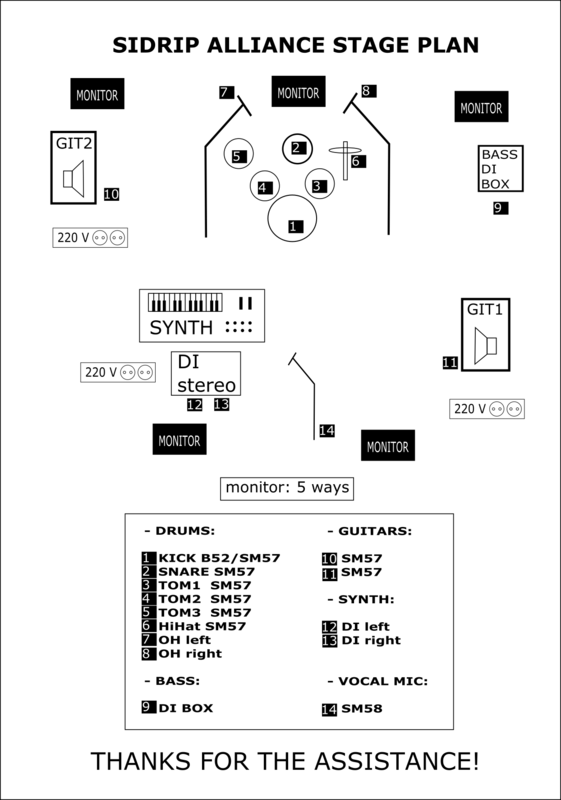 This one will be found on our first studio album which we would like to release in this year. The remix page has got some update: Drudgery from Chabee, Dwarf Fly from Vincenzo, and Electric Jesus from NecroPolo, which is dedicated to the memory of Intensity and won the remix compo of Arok Party 2012. There are two more interesting remixes from him: Test Drive and Kyyhylly arranged to floppy drives :) using Vincenzo's floppy sound libraries. These tracks are available in FLAC format too on our remix page. Árok Party is always a special place for us because this is where we born. We are among friends from the beginning and there is no we and you only the party. This was true this year too: we could give our best performance EVER. NecroPolo's question "Should the blood splutter or flow?" the answer was "Splutter!!!". Later when Hermit played Supremacy on his flute and the audience had started singing ... we thought the mood can't be higher. It could. Thanks to everyone who was there!!! For pictures click HERE, videos coming soon. SIDRIP Alliance will play third time at Ajkarendek, 7th July, 20h. Usual place (our favorite) but new set of songs: we have prepared some surprise :) Before our concert SOULVOID will tune the sound system with some Gameboy chip music. To shorten waiting you can watch videos of party last year. It is time to redeem some debt, so pictures of Moleman 2 and Revision 2012 (thx to Romeo Knight) concerts are online now. As bonus here are some exclusive pictures from one of our band rehearsal. SIDRIP Alliance will play on one of the biggest (and youngest) demoparty of the world - REVISION 2012 - in Saarbrücken (Germany) at 8th April. It will be a HUGE party with many interesting events/competitions/seminars so come and be there! Another concert: this time on afterparty of Moleman 2 movie on 17th November. It will be a great event for the scene members and lovers with many performers, so don't miss it!. Visit organizer's homepage for more details and the trailer of the movie. The power amps sounded very good and the recordings were fine too. Now we have to process them. If everything will be allright we can upload them within a month. Until then you can watch pictures from the show. The SceneSat radio broadcast the concert, what you can listen here (from the 8. minute). We gave an interview too, it can be found here (from the 50. minute). Our remix section has got an update: this time with Vincenzo's great Newcomer remix, which achieved second place at Árok Party remix compo. If you missed this great party you can try to get the feeling with the uploaded videos and pictures. We played "alltime favorite Commando", "surprise Ghostbusters", "Yello Race vs Outrun" and "don't you know this? Power Drift". We enjoyed playing these great SID musics again, thanks to the organisers of the party for the opportunity! Two new remixes of NecroPolo are downloadable from the site: BC Bill (Dreadnought on the Fly) and Zak (McKrackenica edition). With this Zak McKracken remix NecroPolo could win the Árok Party remix compo this year. 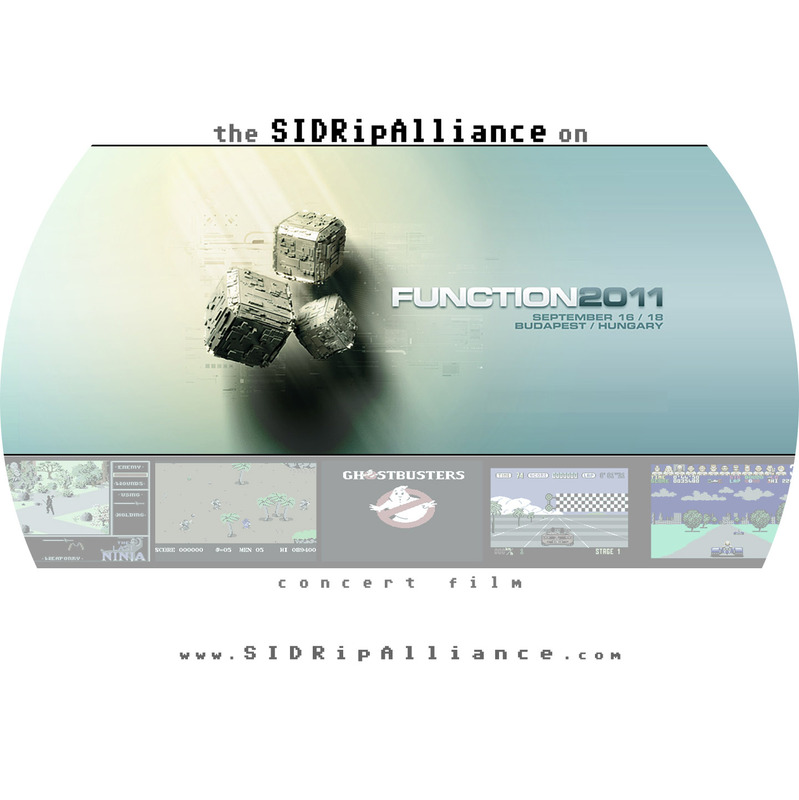 You asked: some tracks from Function X concert are downloadable in MP3, OGG and lossless FLAC format. Download and enjoy! Finally you can watch the best moments our live concert at Function X party. Thanks to our mystical anonymous friend who recorded and edited the video and to Füvesi for the additional shoots. Because stalling our previous server we've moved our site to a new server thanks to a friend who is also a big C64 fan: Gabucino. Mega thanks! 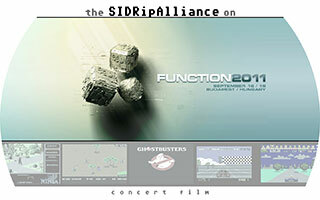 Yeah, the rumors were true: SIDRIP Alliance will play live at Function X party, Budapest, Hungary on 11 September, 20h. Updated! It was a fantastic evening thanks to the numerous and enhusiastic audience. Poison and Leon were boosting the night as an intro band and as our biggest fans too :) For our biggest surprise the (mostly PC fan) audience chose Last Ninja remix as extra song (instead of Duke Nukem). Pictures of the concert can be seen here. We are radio stars :) Our last song (From First to Last - a Last Ninja Medley) has played in SLAY Radio. Thanks Slaygon, Boz and Anna Black! 18.08.2010 Last Ninja Medley released! Finally after many hours of recording and mastering NecroPolo / SIDRIP Alliance proudly presents: From First to Last - a Last Ninja Medley. This is the studio version of the live song which debuted at Árok Party #12. You can download this song and other remixes of the crew from here. Videos of our performance at Árok Party #12 are ready and online. You can watch them here. It seems our news will contains so many THX. This could be because we are very lucky and we have so much talented supporters. So here it comes again: thanks to Füvesi who recorded, edited and uploaded these videos! Now you can read our site in hungarian language. Site is updated with information about the band and some news (what are actualy quite old). In the future the site will updated regularly with infos, date of concerts, new remixes, etc. Pre version of the official site with soundtracks of the concert is up! Big kudo to Singular Crew for hosting our big files. THX! 21.06.2010 SIDRIP Alliance will debut at Árok Party #12! "...and at last, we reveal the secret: This year we are going to surprise our visitors with a live concert! It's going to be the loudest event ever in the Arok Party series! SIDRIP Alliance is going to debut at our open-air stage. You can expect familiar remixes from the 6 members band with concert-quality sound! (Thanks to the Hungarian Demoscene Association it is going to be really LOUD, and really QUALITY sound!) Be there, don't miss the birth of this cool formation!" Story of SIDRIP Alliance started in 2009 at AROK#11 8-bit Party when three C64 musicians (Hermit, NecroPolo, Vincenzo) met. All three were C64 fans with similar attitude and seasoned instrumentalists as well, it was easy to start some plan about forming a SID tribute band. Some time later, the album "cover" of NecroPolo's rakBIT acmum can be considered to be the first SIDRIP co-op project because Hermit did all the programming the C64 executable demo that functions as an album cover. 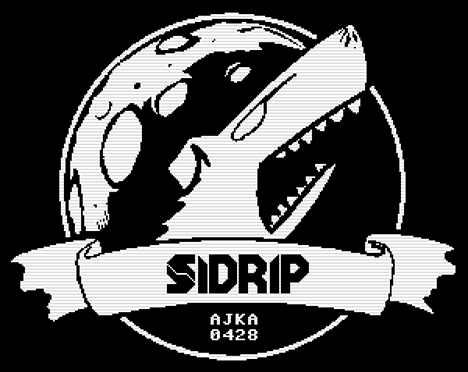 The name "SIDRIP" came from here. It is a new C64 bytestream player developed by Hermit that made including old music files possible. It was a huge challenge. Three weeks before the first concert it turned out that Vincenzo had to miss playing onstage due to his sudden and urgent deadline work assignments that had to be done. He advised to find a new keyboardist, because these wicked chiptunes require much more than just "playing around". So, Hermit contacted Werdy who quickly impressed the others with his constructive attitude, skills, talent and awesome sounds. Learning all the setlist in 3 weeks was a huge challenge but he was completely into it. Drummer SzléjerCsabi added his part to the whole pretty well, too, with the shortest available preparation time (2 weeks). The last week passed with individual practising the songs (1 day before Hermit could even successfully overstretch his wrist with his high-action bass). After all, the band started playing with some "flying blind", hitting strings and other anomalies. Vincenzo contributed to the concert greatly behind the mixing desk, with his experience he created healthy live sound through the PA system. Audience was awesome. Playing was not 100% perfect - but the atmosphere and fun in the concert was. We thought we are ready to the next gig. As always things are never going to be that easy: Hermit and SzléjerCsabi had another program when we had to be on the stage. At least we found a solution: Küki played on the bass and we found a new drummer - Tamás Ölveczky (Chad) - who could easily get the job as he is a skilled musician. This concert (Function X) gave us another crew member: Vector who was convinced by our passion. With his help you can watch our gigs later if you missed them. In 2014 a new/old friend joined to the band on the stage - Gery, Vincenzo's brother - who helped us from the beginning. In this year Hermit had busy time (and many concerts with his other band) and he had to skip our concerts. Gery saved us and the gigs. ... to YOU who were there! ... to our fans in front of the stage and YOU who were there! ... and to everyone who was there! ... to Felix and Lucy for starting and organizing a new demoscene party, ... to our fans in front of the stage and YOU who were there! ... to our incredible fans who support us in every possible way! 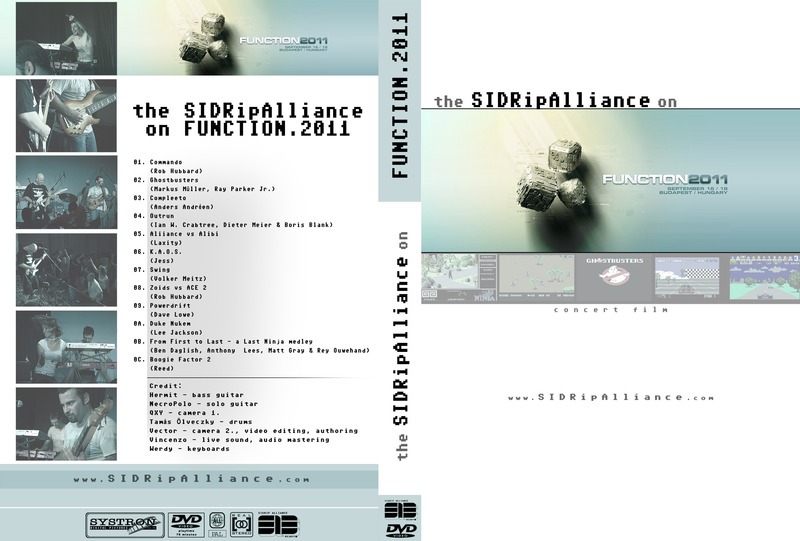 DVD (3.6gb, zip), cover and disc art.